When a man, who was seen acting suspiciously in Portadown, saw police he ran off and threw away something which turned out to be heroin. Bruno Garcia (37), Simon Community, Lisburn, admitted possession of a class A drug, heroin, and obstructing a constable last Wednesday at Craigavon Magistrates Court. 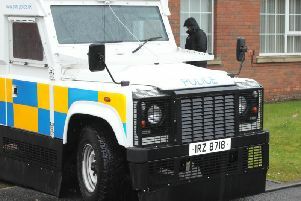 The court heard that on June 3 this year in High Street, Portadown, Garcia was seen acting suspiciously with two other males. When police informed him he was about to be searched he ran off into an alleyway and threw something away. At a later date he presented himself to police and admitted it was heroin for which he had paid £200 and was for his own personal use. The case was adjourned until January 6 for a pre-sentence report.